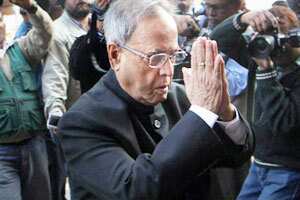 A file photo of finance minister Pranab Mukherjee. New Delhi: India’s slowing growth and rising subsidy bill are seen impacting the country’s fiscal deficit, finance minister Pranab Mukherjee said on Wednesday, with a headstrong, near-double digit inflation also posing a grave concern. Private economists expect fiscal deficit to cross 5.6% of the gross domestic product in the current fiscal year, as India struggles to meet a rising subsidy bill, compounded by a sharp contraction in tax receipts growth. “Growth has come down, inflation is obstinately refusing to be moderated... and consequences of that are going to have a reflection on the fiscal deficit," Mukherjee said. The government bond yields rose in afternoon session on Wednesday as the finance minister said fiscal deficit was a major concern for the government and as investors booked profits following the steep rise in prices in recent sessions. By 04:00 pm, the benchmark 10-year bond yield was up 5 basis points at 8.63%. Mukherjee was replying to a debate on the government’s demand to spend a net additional Rs56,900 crore ($11 billion), on top of the budget target of around $244 billion, in the current fiscal year to end-March 2012. The lower house of Parliament later approved the proposal. Mukherjee said high global crude prices were impacting domestic prices and the government’s subsidy bill, as the government had to partly meet the revenue losses of state-run oil retailers for selling products at state-set cheaper prices. That loss is estimated at Rs1.32 trillion in this fiscal year, he said, as the price of India’s oil import basket has remained around $110 a barrel consistently so far this fiscal, against the budget estimate of around $90 a barrel. Asia’s third-largest economy grew 6.9% in the second quarter ending September, at its weakest pace in more than two years, and is expected to grow around 7% this fiscal. The economy grew at 8.5% in 2010-11. India’s wholesale price index stood at 9.73% in October, remaining above 9% for nearly one year despite 13 rate increases by the central bank since March 2010. “This country cannot afford to have more than 5-6% of inflation," Mukherjee aid, adding, food inflation at 8% was very high.